As advanced as our electronics have gotten lately, the batteries we power them with haven’t really improved much. 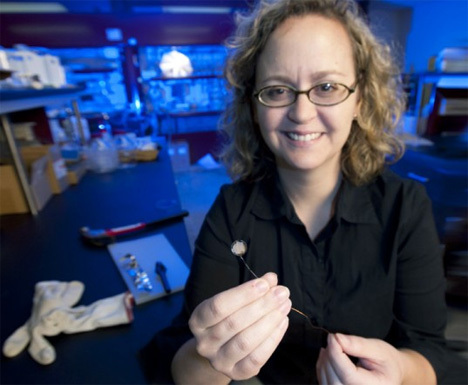 Colorado State University chemistry professor Amy Prieto has created a much smarter kind of battery. The Prieto battery, which is still in the development stages, could hold twice the power of traditional batteries and recharge in five minutes. 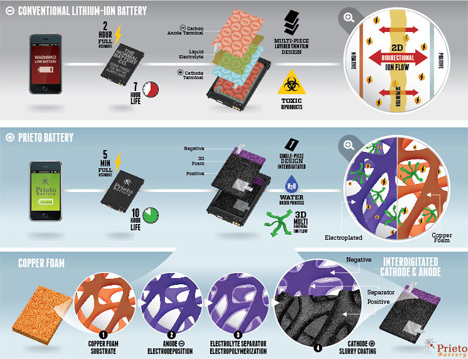 Besides being rather inefficient and requiring frequent replacement, the traditional battery is manufactured with some particularly nasty toxins. These toxins require special treatment and disposal of batteries, although most people still just toss them into the trash with other household waste. The Prieto battery is completely eco-friendly, using nothing more toxic than citric acid in its manufacturing process. As seen in the video above, the Prieto battery uses a three-dimensional power structure rather than the two-dimensional structure used in traditional batteries. This makes it possible for the battery to hold more power and to hold it for far longer than any other battery – both of which could be huge benefits for drivers of electric vehicles and anyone who uses battery-powered gadgets like smartphones or electric bikes. See more in Energy & Power or under Science. January, 2013.